Screen shot from the Airbnb listing for 1601 Dumaine St. The house was built with affordable housing funds. In 2010, then-Mayor Mitch Landrieu delivered a Hail Mary pass to a number of homes slated to be demolished to make way for the new Veterans Administration hospital. The ambitious plan to use tax dollars to save, preserve and move the historic homes was framed as a win-win for preservationists and affordable housing advocates. Now one of those homes is a win for tourists, too. It was moved to a new site in Treme, demolished and replaced with a house built with a grant for affordable housing. Sold to an investor, it’s now an Airbnb. 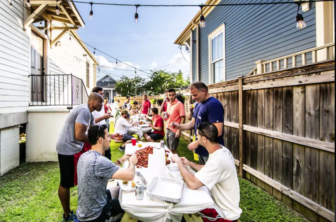 A screen shot from the Airbnb listing for 1601 Dumaine shows a group of men eating crawfish in the side yard. “Is that why the community fought so hard to save those houses, and why the city earmarked funds to make it an affordable homeownership opportunity?” asked Breonne DeDecker of the Jane Place Neighborhood Sustainability Initiative, an affordable housing group that has called for curbs on the expansion of short-term rentals in the city. The city arranged to move about 80 homes out of the way of the hospital to allay preservationists’ upset at the large-scale destruction of a neighborhood dating to the late 1800s. The homes were donated to various nonprofits with the goal that they would be renovated and offered to low-income residents. The city spent $3.2 million in federal funds moving the houses — about $39,000 for each one. The results were spotty at best. A number of the houses eventually were demolished while others still languish in various states of disrepair. In 2012, NOLA.com/The Times-Picayune reported that just 28 had been renovated and occupied. There were a few success stories, but none as convoluted as the house now at 1601 Dumaine St. The last one hauled from the site of the upcoming hospital, it landed in Treme at the corner of Dumaine and N. Robertson Street. The area had seen tremendous reinvestment because of the number of historic homes and its proximity to downtown and the French Quarter. The house sat virtually untouched as Providence Community Housing, the new owner, struggled to find money to renovate it. In 2012, the city cited Providence for ”demolition by neglect.” Providence tried to get permission to tear it down, but that was delayed while the organization sought partners to fund a renovation. In 2013, Terri North, president and CEO of Providence, wrote that the house has been “a thorn in the side of Providence and the neighborhood for a long time.” The house had been vacant and untouched for 30 months since it had been moved to Dumaine Street, she wrote. Later that year, Providence did demolish the structure, even though it never got permission from the city to do so. 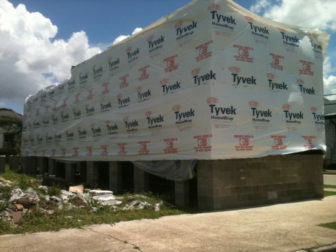 The house on Dumaine Street was covered in Tyvek and open to the elements for more than two and a half years. Then, with $120,000 in HOME funds — federal funding for affordable housing — Providence built a shotgun-style home with three bedrooms and two bathrooms. That funding required the home to be sold to a low-income buyer. That happened in 2015 when Ashley Barra bought it for $180,000. She financed it with a traditional mortgage of $80,000 and two “soft second” mortgages totaling $100,000. Soft second mortgages, typically offered to low-income buyers, are forgiven if certain conditions are met, such as staying in the house for five to 15 years. Earlier this year, the house was back on the market for $329,000. The 1,255 square-foot house sold for $290,000 in May. A portion of the proceeds paid off most or all of the $100,000 in soft second mortgages because Barra hadn’t stayed in the house long enough for them to be forgiven, according to court records. The traditional mortgage was paid off. The Lens was unable to reach Barra to comment on the sale. Days later, the new owner, Ben Harwood, applied for a short-term rental license. It allows the house to be rented for up to 90 days a year. 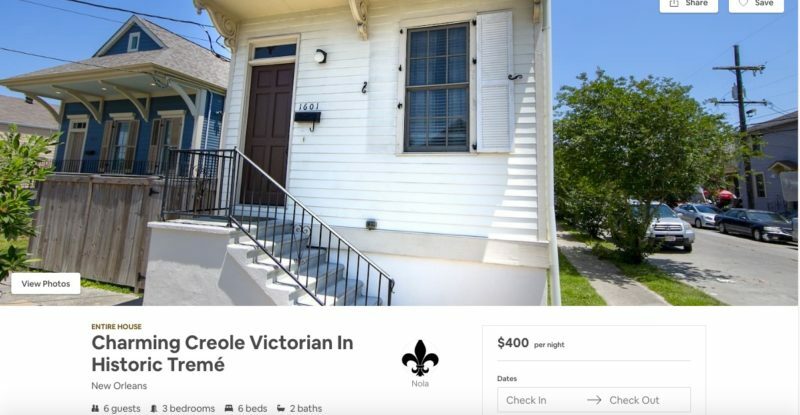 The Airbnb listing calls the shotgun a “Charming Creole Victorian” that up until last week boasted four bedrooms with eight beds. Rates vary from $399 to $900 a night depending on the time of year. Asked why the listing claimed more bedrooms than it has, Harwood said there may have been a clerical error. He had someone correct the number of bedrooms on the listing and the city license. According to Harwood, before he bought most of his properties, they had problems such as blight, prostitution and drug selling. He believes that factors other than the short-term rental market are affecting affordability in the city, including a lack of incentives for high-density housing and a convoluted permitting process. She said short-term rental investors will pay more for a property based on projected income than a homeowner will. “The pressure for homeowners to sell to investors who want to short-term the property is extremely great, and these resulting high-price sales drive up costs for the remaining homeowners and renters in the neighborhood,” she said. That’s why people like Maxwell Ciardullo of the Greater New Orleans Fair Housing Action Center advocate for community land trusts. That system, which hasn’t been adopted as public policy in New Orleans, puts deed restrictions on properties, requiring them to be sold to people who need affordable housing.